Can you please send a sample .gno file to support at genopro dot com which causes the crash and I will investigate. We have been investigating the bug and our conclusion is the following: there is a memory leak in the VBScript Engine of Windows 10. When we run the report generator under Windows 7, the memory commit size is around 93 MB and remains stable during the whole time. When running the same report under Windows 10, the memory commit size jumps by several MB every second. Remember: GenoPro 2016 is a 32 bit application which can only access 4 GB (4,000 MB) of memory. It does not matter if your machine has more than 4 GB of RAM because the 32 bit application cannot access the rest. One temporary solution is to run your report generator with an older version of GenoPro. As far as I aware, there is no memory leaks running GenoPro 2016 on the following platforms: Windows 98, Windows 2000, Windows XP, Windows 7, Windows Vista and all server versions of Windows. as the report can not be generated anymore :where can we download this older version - can we install it next to the current version ? this problem only occurred recently - would it be possible to downgrade vb ? is vb part of O/S or manually installed ? VB, or Visual Basic, is different from VBScript. The latter is installed as part of the OS. On my copy of Windows 10 I noticed that vbscript.dll had been updated on 11/07/17. I don't know how recently your problem started, but this update to vbscript.dll occurred as part of Windows Update 'Security Update for Microsoft Windows (KB4025339). If you have this update it might be worth uninstalling it via Windows Update to roll back vbscript.dll. The problem does not occur on my .gno so unable to test if this is a solution. Alternatively you might like to try the attached individual.htm template by dropping into your Narrative Common\Code folder to replace the existing version. This version has been amended to free up objects when no longer required in an attempt to minimise memory usage. Hmm, not sure what is happening, does the memory increase steadily throughout or just at the failure point? If the latter then maybe its due to a particular record casing a loop in the script. 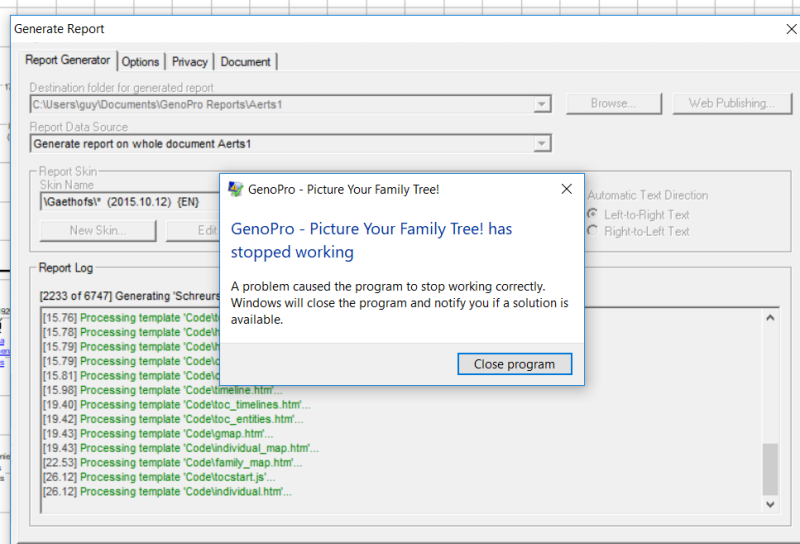 I used your .gno from familytrees and it generated successfully under Windows 10 Home 64bit using just 66Mb of ram and also on Windows 10 Home 32bit where is used a mere 30mb of ram. Does that .gno still fail for you?